As runners lined up to pick up their bibs for the Boston Marathon, many were thinking about the race they've prepared for so long. "This is the Mecca of running, and this is what everybody strives for, works hard all year long to have this. It's a blessing, it's a pure blessing," said Laura Fenster of Fresno, California. Runners and their families and friends enjoyed the nice weather on Saturday, many of them heading to the Finish Line for pictures. "The weather is amazing. This morning it was raining, now it's the sunshine. It's great. Boston is amazing," said Thais Moura of Sao Paulo, Brazil. Moura, who is in town from South America, said this is a dream come true. "I have been pursuing my qualifying time, and I did that. And I'm going to be running Monday. I have goose bumps now... I have no words for that," she said. There are many first-timers in town, including Maria Payne from San Antonio, Texas. She says she's just trying to enjoy the moment. "Look at this city. This city is fantastic, every store... the flowers in the windows. I think Boston does this right," she said. 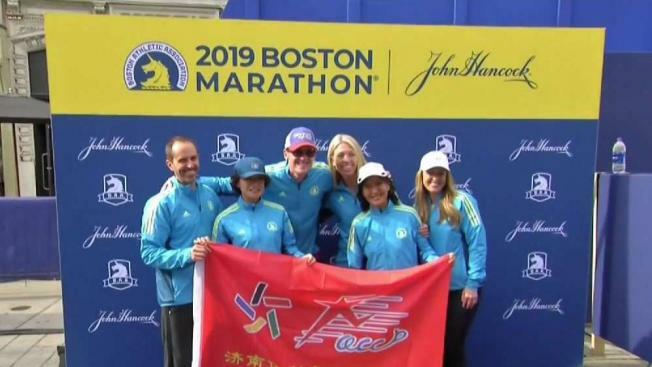 Ana Croger, of Brisbane, Australia, is in Boston for the first time to run the marathon. "I've been to a Red Sox game, a city tour, I've been to the Expo, it's been crazy," Croger said. Kathy Linenberger, of San Diego, California, is also visiting Boston for the first time to run in the marathon. "I've been waiting many, many years to come to Boston and run the marathon," Linenberger said. "This is my first time, I'm just thrilled." Linenberger is thrilled, and thinking about the weather. "We were at the 5K this morning," she said. "We tested out our rain jackets. We came prepared. I have 55 layers at least, 16 ponchos, rubber gloves. We've got everything because we knew if we brought all that, it wouldn't rain." The weather on Marathon Monday is one of the hot topics. After last year's wind-swept rain and cold temperatures, this year's race could be gloomy as well. "I did it last year, so there's absolutely nothing nature can send us that's worse than last year," Chris Tobias, of Baltimore, Maryland, said. Officials are also preparing for the marathon, and the possibility of bad weather. "The uncontrollable is always out there," said Sean Quirk, head coach of the Boston Cannons. "Last year was really tough with the weather, so expecting it to be a little bit better this year hopefully." There are some extra precautions race organizers have announced because of the potential for rough weather, including no delay this year between Waves 3 and 4. That's to lessen the amount of time Wave 4 runners have to wait in the Athlete's Village before they begin. And along the course, there will be extra gear and facilities to help runners and volunteers who may be struggling. But there's no talk of postponing the race. "The marathon is run on Patriots Day, or it's not run," said Tom Grilk, CEO of the Boston Athletic Association. There will be a massive amount of security in place, but there are no credible threats to the event. "We know what happened before," said Boston Police Commissioner William Gross. "Let's be each other's eyes and ears. This is our city, our marathon, let's look out for each other."